Blogging live is not an exact science as by nature Bloggers are great live tweeters however we hone our words and posts over several coffees, tea in my case, some very necessary editing... (apologies for early readers yesterday - it's HUGH RICE, not HUGE RICE, now corrected but thought you might enjoy my short lived typing slip) ...and you wouldn't believe how long we take over choosing which pics to use! All this is a prelude to saying, today in Hull, we're going to turn this on it's head and live a little dangerously, hope you'll join us for the ride! Last weekend I set off in search of information from some of Hull's finest to be able to do today's catwalk some justice. As a Hull adoptee myself, covering our Leaders in Hull's Fashion Legacy and the first catwalk of the day is both exciting and a bit daunting. Unsurprisingly for me I found the shiny things first, good job I'd turned up early to set up - gave me more time to browse the stalls! I was good though and didn't buy anything before the doors opened to the public, fair's fair after all! To ease me in (and everyone else, it's not all about me y'know) Luke and Lizzie introduced the day and Konvict warmed the crowd up with some energetic dancing! After which I did stop typing long enough to enjoy some songs from Kristian Eastwood to get me in the mood... as his second song was Fever (a favourite of mine) I was all set for the first Catwalk Show of the Day! I have a soft spot for Beasley's who are appearing in today's show as the place I used to buy, amongst other things, my Docs. Indeed when I got married I bought my "wedding docs" from there... it was a long dress and who says you have to compromise your own fashion style! As they were planning to use the very latest clothes arriving from America for the catwalk show; I had no sneak previews, as they were literally expecting the delivery with a very tight deadline. A tweet late last night confirmed they were good to go! Phew! Cinderella can come to the show! They also know how to set up a great stall! Complete with garden gnomes! HUGH RICE are providing all the jewellery for today for the presenters and models alike as well as sponsoring the Big Screen that was set up outside. You can check out my Behind the Scenes Post from earlier this week, suffice to say I had a wonderful couple of hours with their staff team and their attention to detail was great. They make a nice cup of tea too! A big shout out to Leonard Silver menswear who have been incredibly helpful to this female blogger when it comes to the menswear section, great customer blogger service and if that translates to the experience you guys get when you're shopping with them then I can totally see why they've been going strong since 1946! So what else was on the catwalk? Aside from jewellery from Hugh Rice, Leonard Silver and Beasley's - we were treated to fashion trends from House of Fraser, Debenhams, Hull School of Art and Design and Gansey Jumpers from the Hull Maritime Museum. Phew that's my section over with now. Time to download and edit all the photos and check a few facts with my blogging colleagues before this gets published in time for my (self-imposed) 3pm deadline. So time for a late lunch; food today is being provided by Thieving Harry's and if you think that sounds a bit familiar it's because they're opposite Oresome Gallery! Yet another good reason to head down to the Fruit Market Quarter. 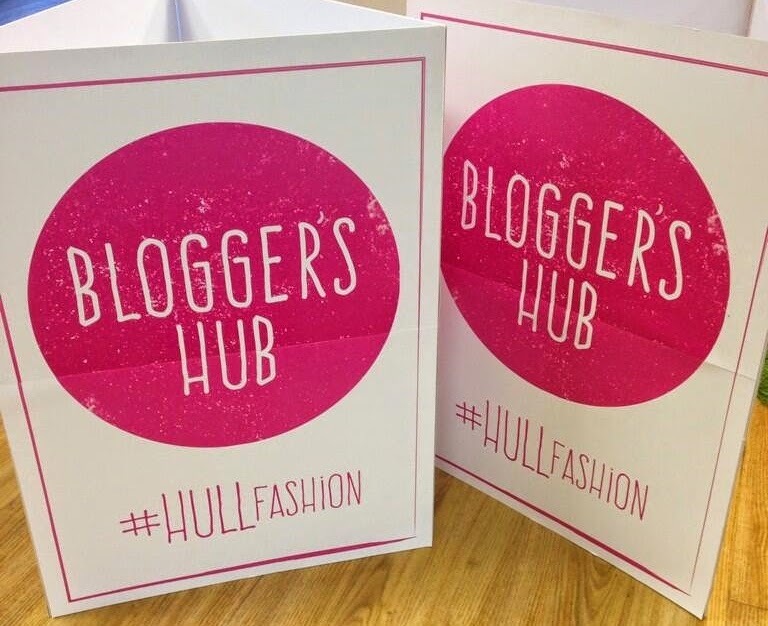 Time for me to say goodbye, Hull Fashion Week Blogger Mars over and out! I have to say all props to the Hull Fashion Week team for putting on a superb and varied series of events throughout the week, all over the city centre! They managed to both capture what's so unique about Hull as a city as well as provide something for everyone. Props also to all the individuals, shops, designers, brands etc taking part - it really was a team effort as you can't organise something so awesome if no-one gets involved! Brilliant post Mars. Still laughing at HUGE Rice!